The Ford Ranger made the return to the US for the 2019 model year and it debuted early in the year. The new Ranger is what we expected, the global model-based version with the turbocharged gasoline engine and plenty of modern tech and safety features. The new truck is significantly smaller than the best-selling F-150 but wins with great maneuverability. There is also the off-road-focused FX2 and FX4 packages with off-road tires and suspension, a Terrain Management System, etc. Buyers love the off-road versions and Ford knows that of course. The brand already debuted the 2019 Ford Ranger Raptor version for the global market and US -spec model should also appear. Ford applied the similar recipe to the mid-size Raptor like on the full-size F-150 version. However, the recently presented Raptor has the diesel mill under the hood while US-spec would get the gasoline powerplant. Other aspects should stay very similar but we are still waiting for the US Ranger Raptor to see the light of the day. 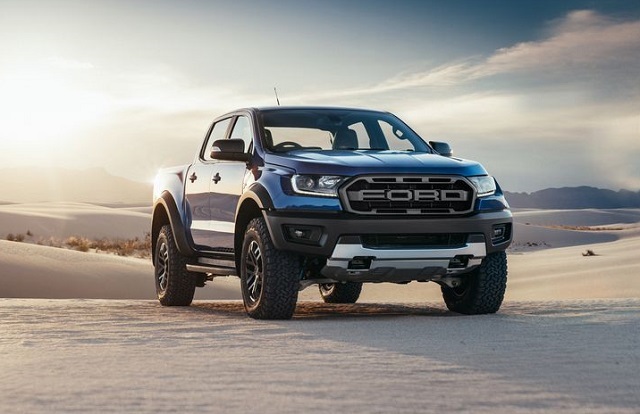 The Ford Ranger Raptor likes to go beyond the paved roads and Ford equipped it with the impressive off-road hardware and features to do the job well. 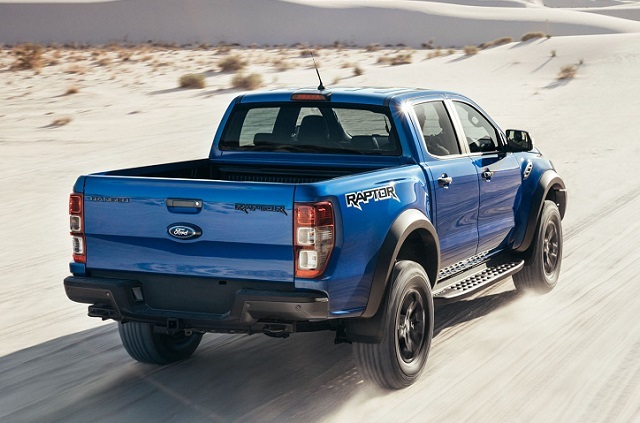 The 2019 Ranger Raptor uses the tested and proven recipe of the bigger F-150 Raptor and applies it to the mid-sized proportions. For the increased stability the truck has 5.9-inches wider front and rear tracks while the overall width is up for just 0.7 inches. Ford also lifted the ride height to 11.1 inches while the model boasts 32-degree approach angle and departure angle measures 24 degrees. The visual perspective is also similar to the bigger version. The Ranger Raptor grille has the same shape as other versions but comes with block FORD letters and black finish. The hood also has muscular lines and chunky fender flares also add to the stronger presence. The Ranger Raptor also includes nicely accentuated headlights and silver-painted underbody protection. The massive all-terrain tires round up the perspective. The Raptor’s cabin also features some unique touches but familiar overall design we saw on the regular versions. The model uses the leather and microsuede mixed upholstery. The Raptor lettering is also signed inside the cabin and contrasting stitching also improves the interior design. The Raptor model will also include Sync 3 infotainment system and premium sound system. It will also provide the internet connection and offer some of the safety systems. More details will appear soon. The 2019 Ford Ranger Raptor looks great but the visual perspective is in the shadow of the performance. The global market version has the 2.0-liter twin-turbo diesel inline-4 engine with 210 ponies on the count. Ford combines this engine with the 10-speed automatic transmission. The Ranger Raptor also boasts improved wheel travel and Fox Racing Shox internal-bypass dampers. More high-strength steel has also been integrated to the frame structure. The Raptor also includes larger diameter brake rotors for the better stopping power. The model also exploits a Terrain Management System. For the US version, Ford will surely install the gasoline turbocharged engine. It could use a 2.7-liter twin-turbo V-6 with power figures around 325 hp. The solution for the US version could also be a 2.3-liter turbocharged inline-4 EcoBoost from the Mustang. This version would produce around 310 hp. Ford hasn’t yet announced the 2019 Ford Ranger Raptor for the US market. The global version will cost around 22 percent more than the currently most expensive Wildtrak version.